De basis van onze custom made producten is materiaal van a-kwaliteit en een focus op de lange termijn. Het resulteert in duurzame oplossingen met een optimale prijs-kwaliteitverhouding. Proceskranen moeten ook onder minder gunstige omstandigheden volledig inzetbaar zijn. De kraankoelers uit de VKS-serie zijn speciaal ontworpen voor omstandigheden waarin hoge temperaturen, straling, vibraties en stoffige en vervuilde lucht aan de orde van de dag zijn. Met een VKS-unit worden het kraanhuis van uw proceskraan en de elektrische apparatuur optimaal gekoeld, en bent u zeker van een ononderbroken productieproces. De VKS-productgroep wordt gekenmerkt door haar flexibiliteit. 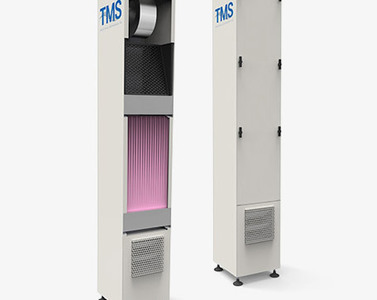 De koelcapaciteit loopt uiteen van 2,5 tot 50kW, en functioneren onder omgevingstemperaturen tot 90°C is geen enkel probleem. Uw VKS-oplossing kan als pakket- of als splittype worden geproduceerd, zowel verticaal als horizontaal. 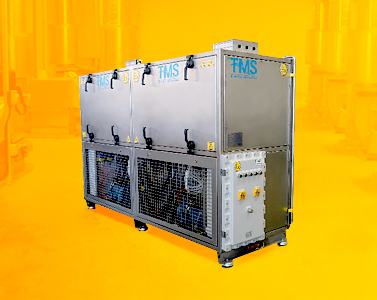 ACU Series (Aircraft Cooling Unit) is a mobile unit that provides service to parked aircrafts using diesel or electrical engines. 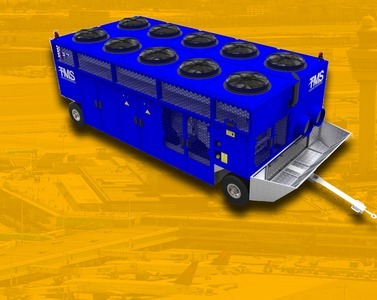 For aircrafts parked at a distance from passenger stairs, the ACUs provide air-conditioning service to aircrafts. 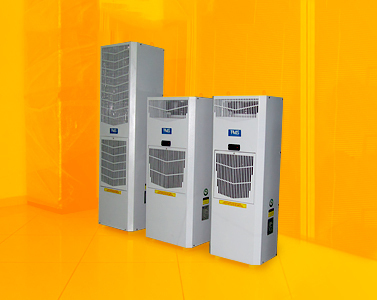 ACU units are used in situations when there is no other outside power or air-conditioning service. The system provides filtered and conditioned air to electronic equipment, the cockpit and the passenger cabin. The air-conditioning service is provided for the electronic equipment and the passenger cabin prior to take-off. Otherwise, the passengers would face CO2 concentration and high temperatures which creates a great deal of discomfort. ACU has lower cost compared to the present APU systems, thus it already is a system used in many airports around the Globe. In average the return on investment (ROI) of an ACU system is between six months to year depending on the airports. 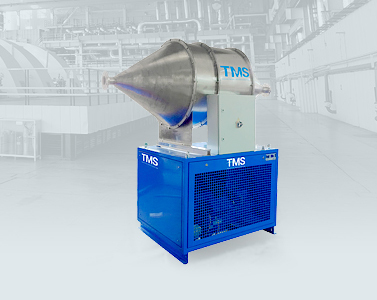 TMS-ACU units are designed and developed by TMS engineers that are highly experienced in ground services. Efficiency, safety and ease of maintenance are the core of the design and is the result of high technology used in creating ACU units. Flexible hoses connected to the aircraft provide air-conditioning to maintain the inside of the aircraft at desired temperatures at outside temperatures ranging from 20°C to 40°C. 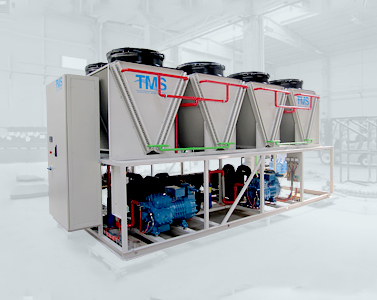 ACU Series units can be modified to answer the needs of tropical climate conditions. ACU series consist of five models ranging from 1,25kgs to 6,5kgs capacities. 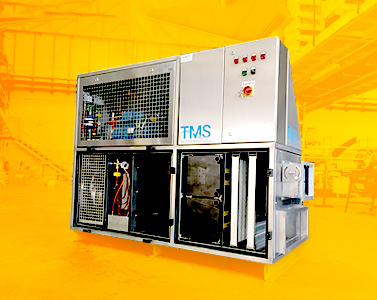 Efficient and compact heat exchangers are being used and depending on the size of the models, semi-hermetic or screw compressors are used to insure reliable and safety equipments. Built-in, user friendly touch panel with PLC automation and special software provides the ease of remote monitoring. 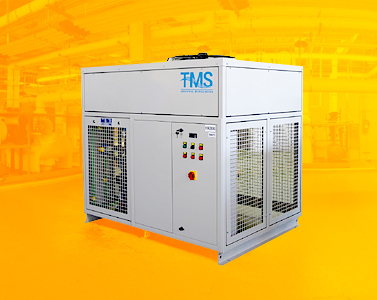 The air pressure is being balanced and regulated by high pressure fans and frequency invertors. ACU series automation panel provides communication protocols using PLC and Web server, Modbus/TCP, BACNet, FTP, DHCP, DNS, NTP. 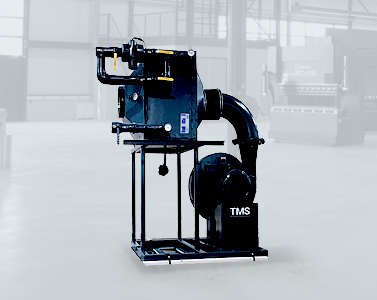 The upper body of the equipment is made of GRP (Glass Reinforced Plastic) material for weight efficiency. 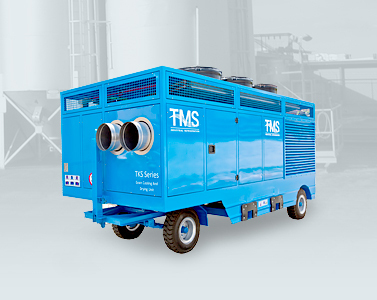 The generator sets are supplied from leading global brands distributed in many parts of the World that can be easily provided in case of need. Please contact us for more detailed information concerning our ACU series product line.